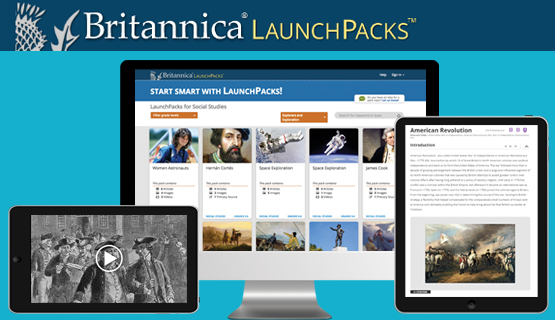 Teachers can save time and make social studies classroom lessons more productive with LaunchPacks™: Social Studies, a new K-12 digital solution from Britannica Digital Learning. Designed for social studies classroom use and to make lesson planning more efficient, it helps teachers engage students with ready-to-use content that covers the entire curriculum. LaunchPacks includes more than 1,600 current, trustworthy and highly relevant content sets, from American Folk Heroes to World War II, offering a full range of articles, images, videos and primary sources presented in an engaging interface and optimized for any size device. Teachers will spend less time searching for resources by having what they need in one place. – Most articles are available at three different levels, so teachers can easily differentiate reading instruction for students. – Teachers can choose what works best for their students and curriculum focus. They can customize LaunchPacks by adding or removing content, appending notes or uploading their own content to share with others. – LaunchPacks covers the accomplishments and contributions of a broad and diverse array of social and ethnic groups, races and genders, with stories, articles, references and timelines that feature events from all over the world. – Content packs are designed with interrelated elements—articles, images, videos, documents—to provide a rich context and the full story of events. Teachers tell us that finding relevant, reliable material for lessons is enormously time consuming. LaunchPacks: Social Studies has what they need all in one place, so it will save them time, with content their students will find compelling, accessible and diverse. LaunchPacks has already received several district-wide adoptions around the country. More information is available at BritannicaLearn.com and 1-800-621-3900.